The grand hall of the recently opened world famous concert hall is designed to have optimal acoustics for classical music. 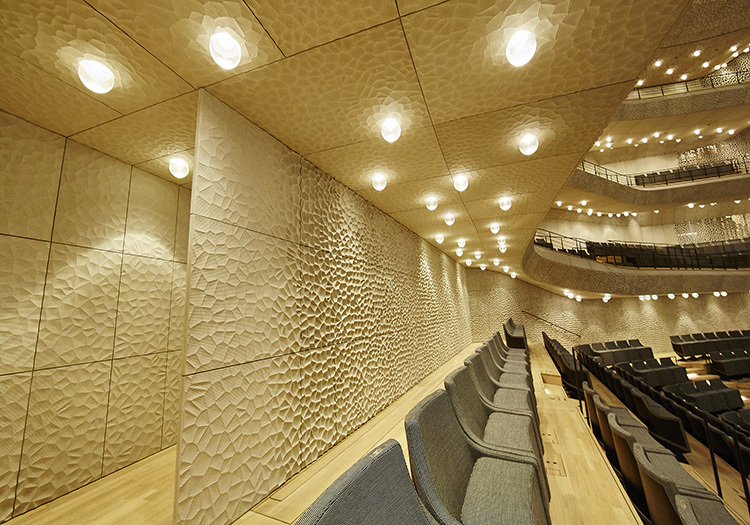 Each of the 10.000 unique acoustic panels that line the ceiling, walls and balustrade adds to the wonderful acoustic appearance of the concert hall. Nonetheless it is important that the hall can be acoustically transformed to host events other than concerts in the classical music genre. This acoustic transformation includes reducing the reverberation time in the hall and avoiding early reflections from the balustrades’ back walls. 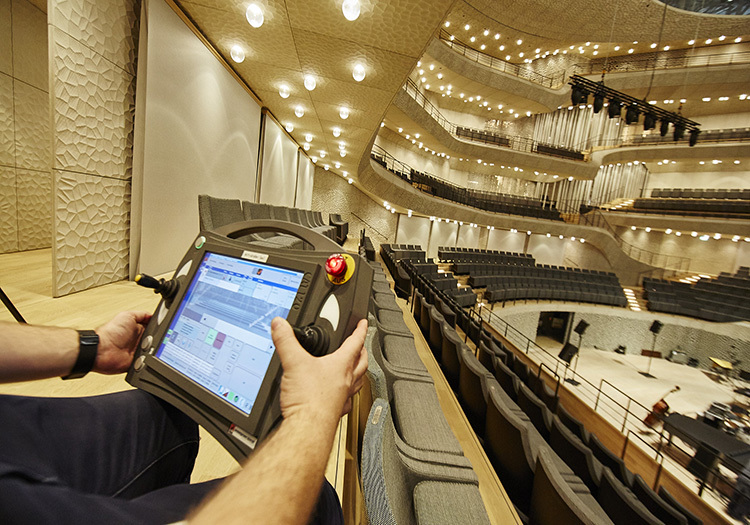 Therefore a variable acoustic mechanism, developed by German company Gerriets, had to be included in the hall. In past projects variable acoustics has often been achieved by using curtain or roller banner systems, both installed on the ceiling of the hall. 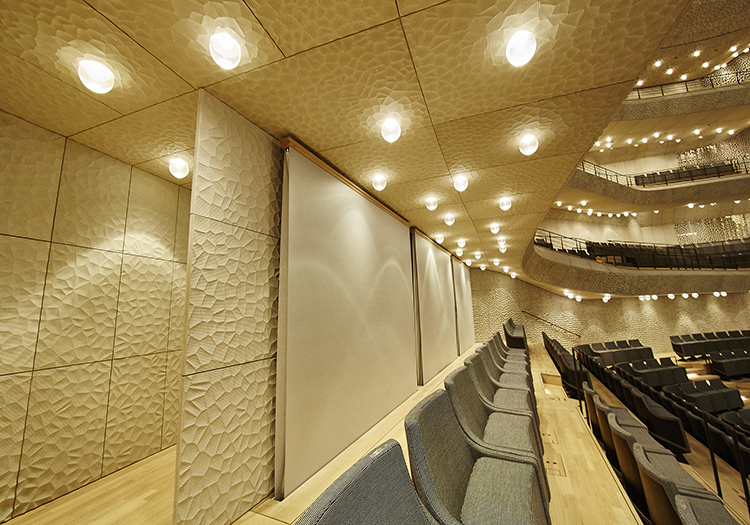 In the case of the unique structure of the Elbphilharmonies grand hall, attaching such systems to the ceiling was no option because of the unique surface created by the acoustic tiles. A large enough absorption area had to be introduced to adjust the acoustics of the hall to be fitting for Jazz or Rock- and Pop concerts. 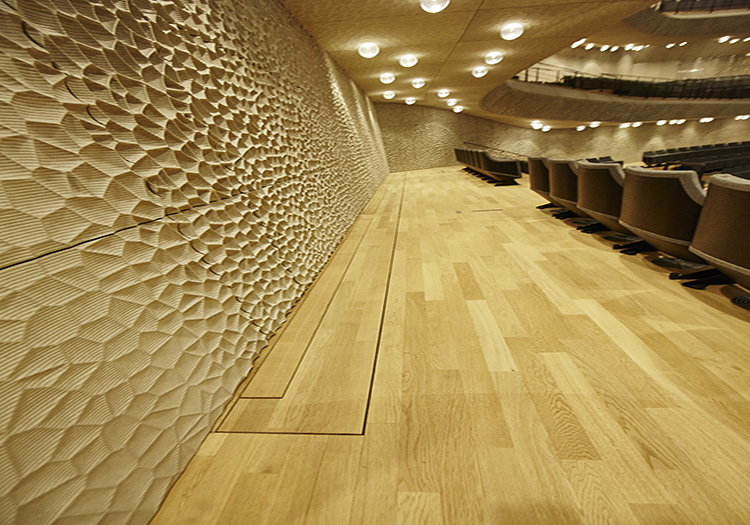 A new product had to be designed to change the acoustics by the push of a button: acoustic panels which can be raised out of the parquet floor. 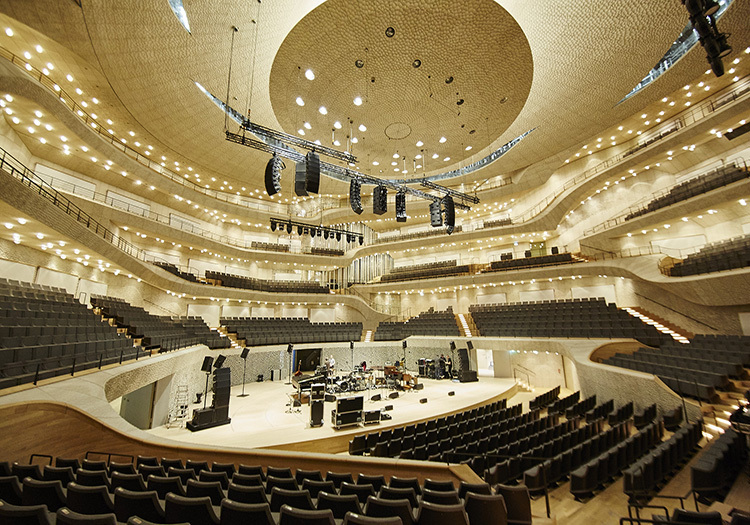 These 84 banners in the grand hall were specially designed for the Elbphilharmonie and are used on a weekly basis to transform one of the most famous concert halls in an event space to host any other kind of concert. The absorption banners had to blend in into the stunning atmosphere of the grand hall. Therefore the surface of the banners had to match the unique acoustic tiles in colour and structure. But also mechanical needs had to be met, such as tensile strength, flame retardancy and of course the acoustical properties. 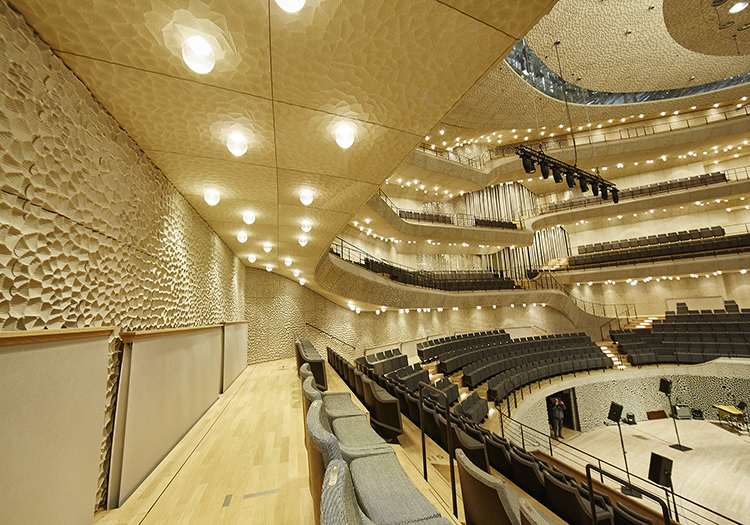 Gerriets’ engineering and acoustic specialists came up with a solution that is completely invisible in the retracted state and which blends in with the Elbphilharmonies unique interior design when in use. The banners had to be integrated in the parquet flooring and had to be invisible in the lowered state. Therefore the parquet floor itself is used as the top part of the banner mechanism. The complete mechanism is hidden underneath the parquet floor and under the surrounding wall elements. Also the small hall and recital studio have been equipped with variable acoustics. In these venues traditional elements such as acoustic drapery and roller banners included in the ceiling of the small hall were used.